Standard quality control of each lot Western blot analysis (unlabeled antibody, #AGT-005), and immunohistochemistry (labeled antibody). Immunohistochemical staining of rat frozen cerebellum sections using Anti-Vesicular GABA Transporter (VGAT)-ATTO-594 Antibody (#AGT-005-AR), (1:100). 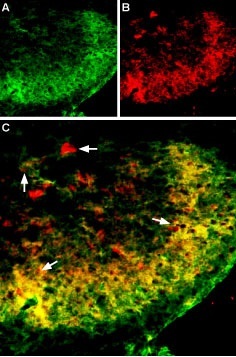 A. VGAT staining is shown in red. 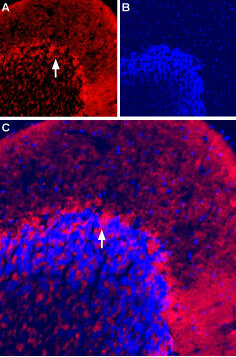 B. DAPI is used as a general cellular marker (blue). C. Merge of A and B reveal that VGAT is most intensely expressed in the granule and pyramidal layer (arrow). Gasnier, B. (2004) Pflugers Arch. 447, 756. McIntire, S. et al. (1997) Nature 389, 870. Chaudhry, F.A. et al. (1998) J. Neurosci. 18, 9733. Dumoulin, A. et al. (1999) J. Cell Sci. 112, 811. Chessler, S. et al. (2002) Diabetes 51, 1763. Anti-Vesicular GABA Transporter (VGAT)-ATTO-594 Antibody (#AGT-005-AR) is directly labeled with an ATTO-594 fluorescent dye. ATTO dyes are characterized by strong absorption (high extinction coefficient), high fluorescence quantum yield, and high photo-stability. The ATTO-594 fluorescent label belongs to the class of Rhodamine dyes and can be used with fluorescent equipment typically optimized to detect Texas Red and Alexa-594. Anti-Vesicular GABA Transporter (VGAT)-ATTO-594 Antibody has been tested in immunohistochemical applications and is specially suited to experiments requiring simultaneous labeling of different markers. Anti-Vesicular GABA Transporter (VGAT) Antibody (#AGT-005), (for western blot analysis).